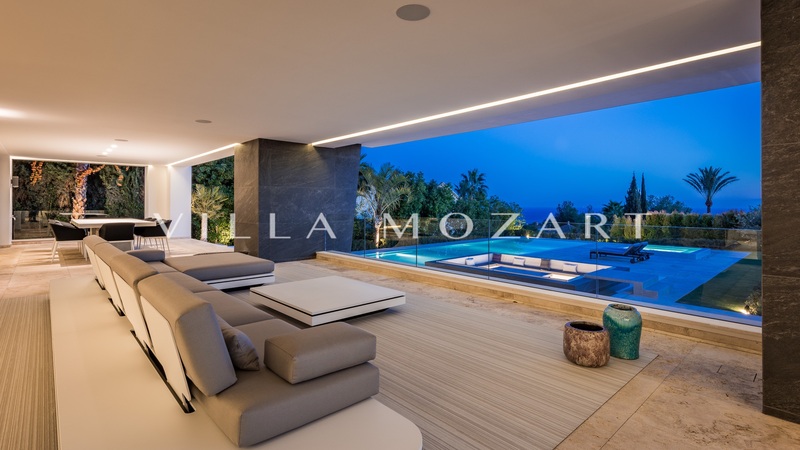 Laid out over three floors, plus a breathtaking rooftop solarium, Villa Mozart has been designed as a symphony of large, light-filled spaces that flow seamlessly together, like a perfectly composed piece of music. 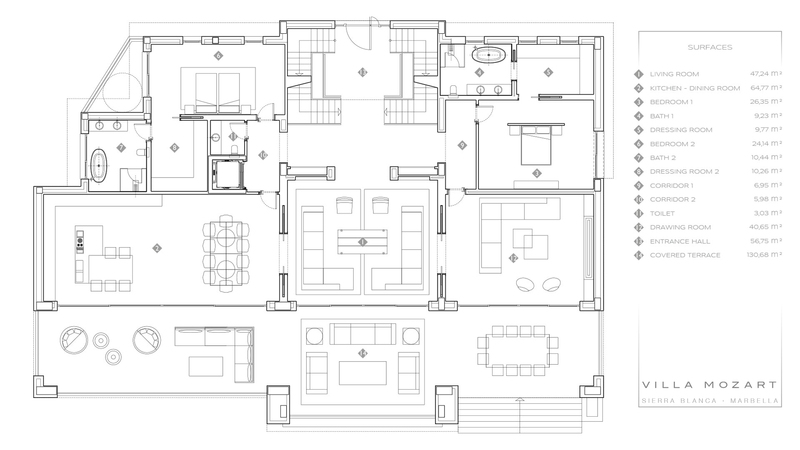 Like the movements that make up a masterwork, each floor has been conceived to suit a different purpose: from the diversions of the entertainment level in the basement to the space and airiness on the entrance level, and from the calm and quiet of the bedrooms on the upper level to the dramatic views of the top-floor terrace. 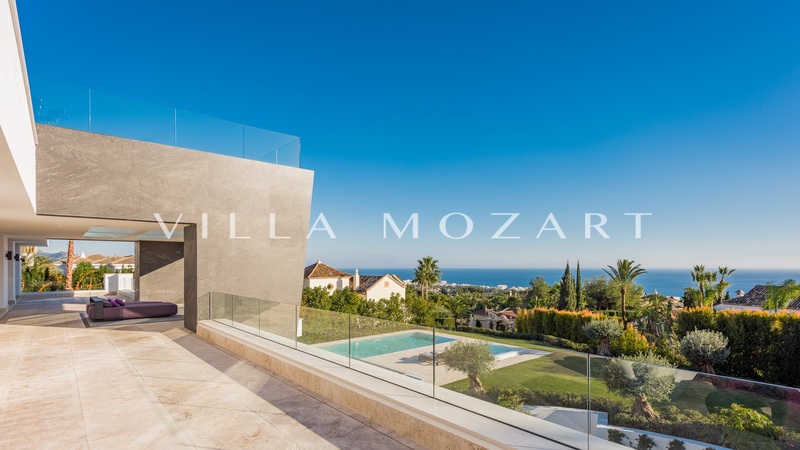 On the entrance level, a series of generously sized living spaces open onto the enormous covered terrace overlooking the gardens and pool, providing uninterrupted views of the Mediterranean as far as the eye can see. 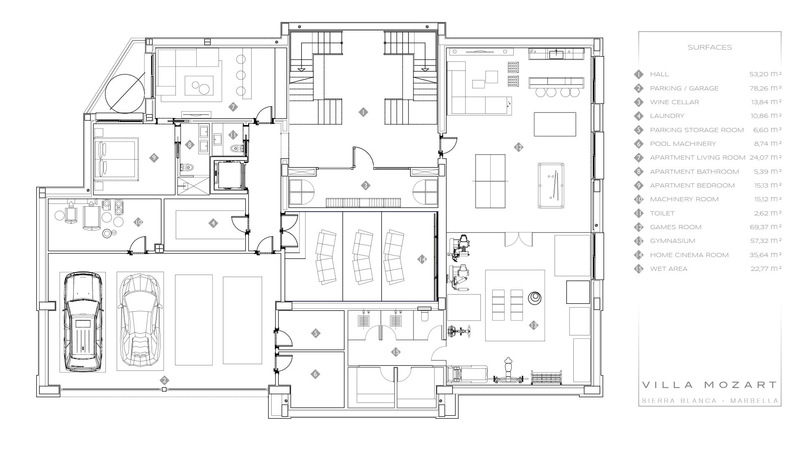 There are also two guest bedroom suites, both with private bathrooms and dressing rooms. 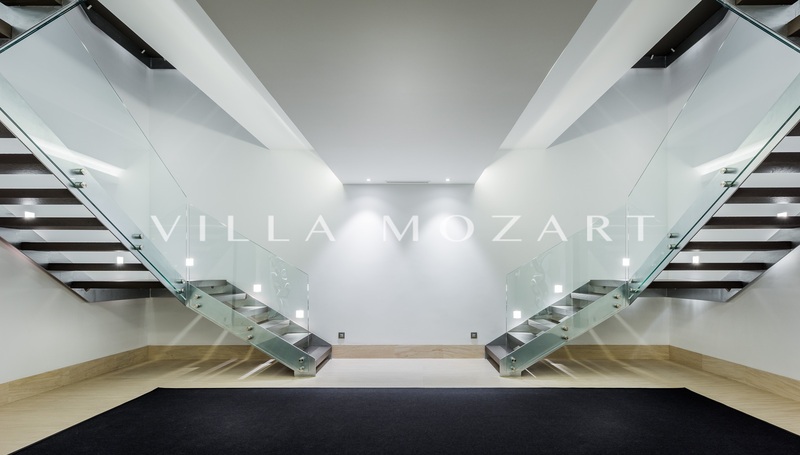 Leading directly off the entrance hallway, the living room has been designed to convey the sense of space and light that is echoed throughout Villa Mozart's interior architecture. 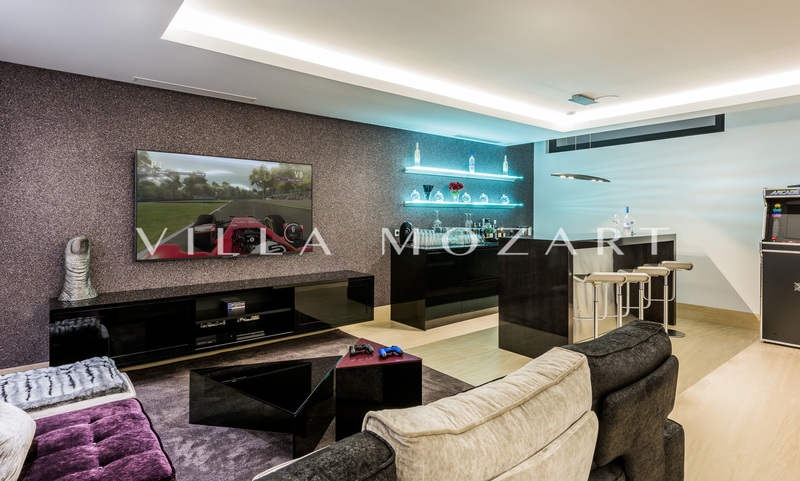 The living room is a large, bright space, completely free from visual barriers, that opens out onto extensive covered terraces, thanks to a fully glazed wall to the south. 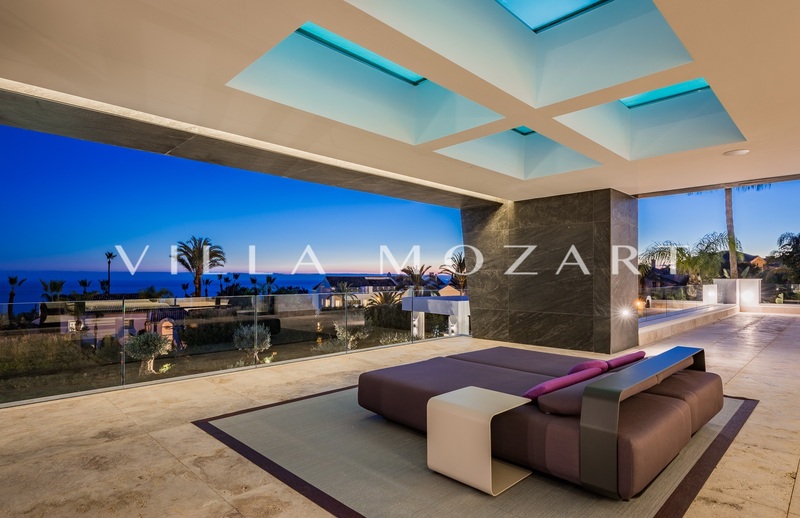 At the same time, the interior design is full of details that differentiate it from adjoining spaces, focusing your attention on the breathtaking views of the garden and, in the background, the Mediterranean Sea. Directly adjoining the living room, the cutting-edge kitchen occupies a space of more than 40m2, also opening to a dining terrace to the south, flooding the room with light. 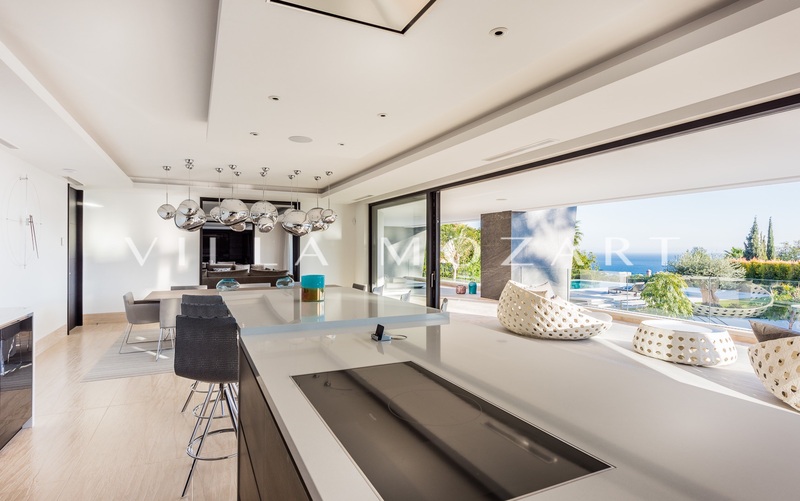 Fully equipped with state-of-the-art appliances and a wealth of design details, it is structured around a central island that encompasses a large cooking surface, an informal dining area, and a breakfast bar. One wall of full-height cupboards houses most of the main appliances, while another wall of sleek furniture provides space for additional work surfaces and storage. The upper level of Villa Mozart is, without doubt, the most restful area of the house, transporting you into a realm of relaxation in its luxurious bedroom suites. 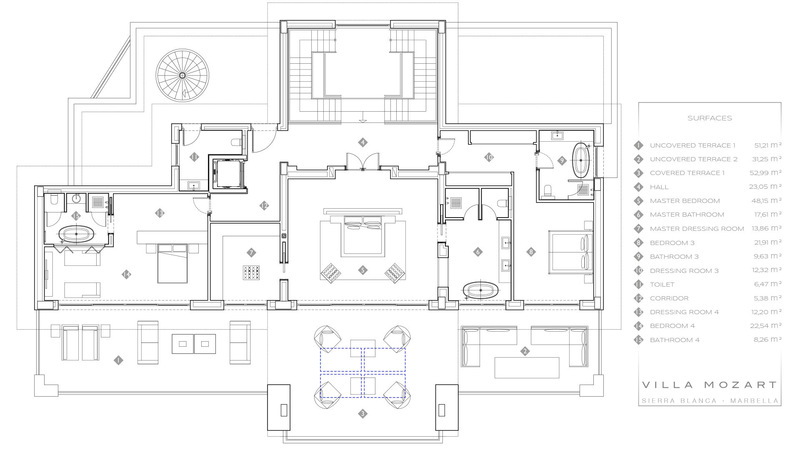 The upper floor is home to the master suite, with over 48m2 of interior space and a 53m2 private covered terrace, it has a feature fireplace, two dressing rooms and a bathroom, with twin sinks, freestanding jacuzzi bath, enclosed W.C., and separate shower. 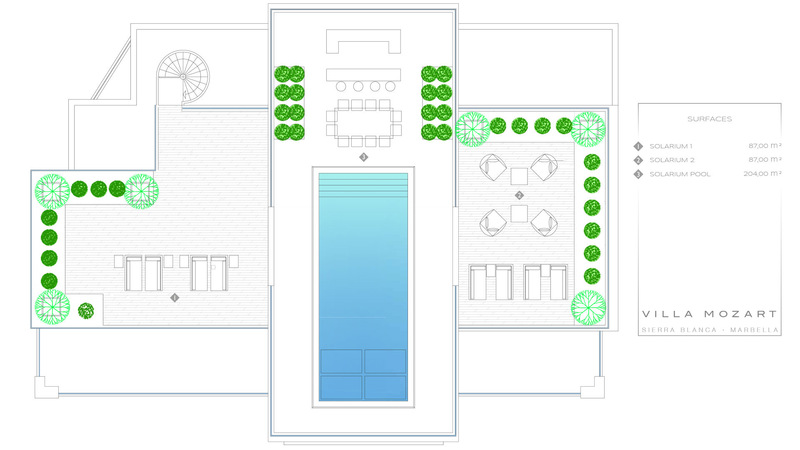 There are two additional en-suite bedrooms on the same floor, one with its own sitting area and both with dressing areas and access to the terrace. 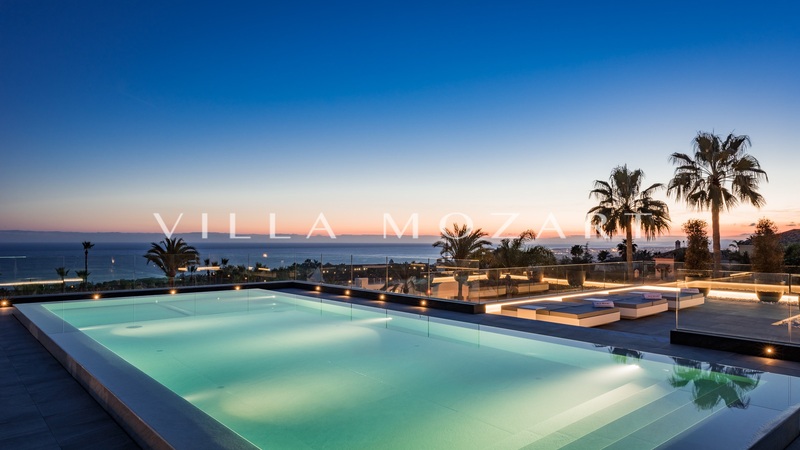 Villa Mozart's rooftop terrace is the ideal place to chill out and make the most of sunny evenings all year round. 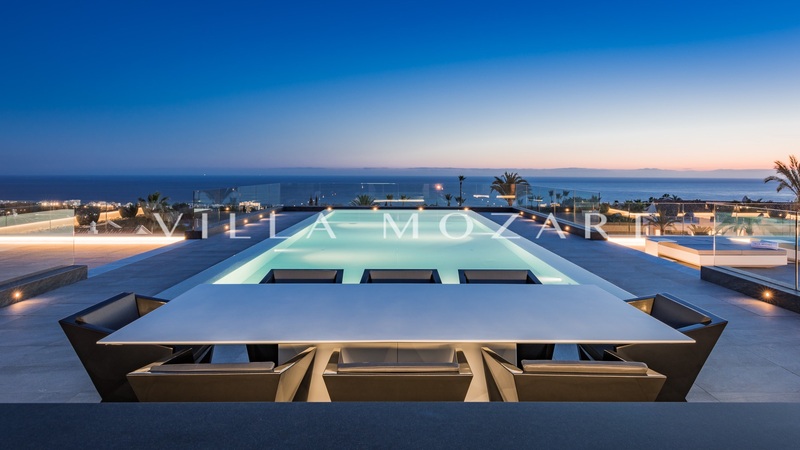 With more than 200m2 of space, it boasts an infinity swimming pool that stretches to the horizon. 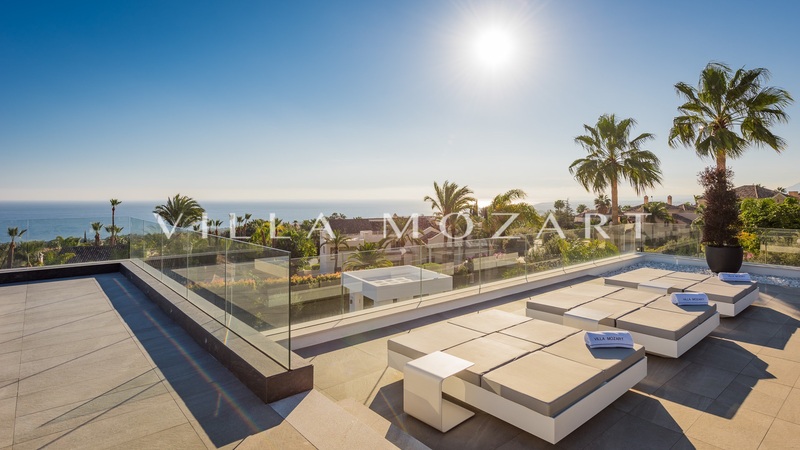 Reached by an external spiral staircase, the rooftop terrace not only features a stunning pool that floats over the master suite terrace below, but also has lots of living space to soak up the sun and enjoy al fresco dining. With a bar and dining area and plenty of space for sunloungers, it will be finished in luxury materials, making it perfect for entertaining friends or relaxing with your family. 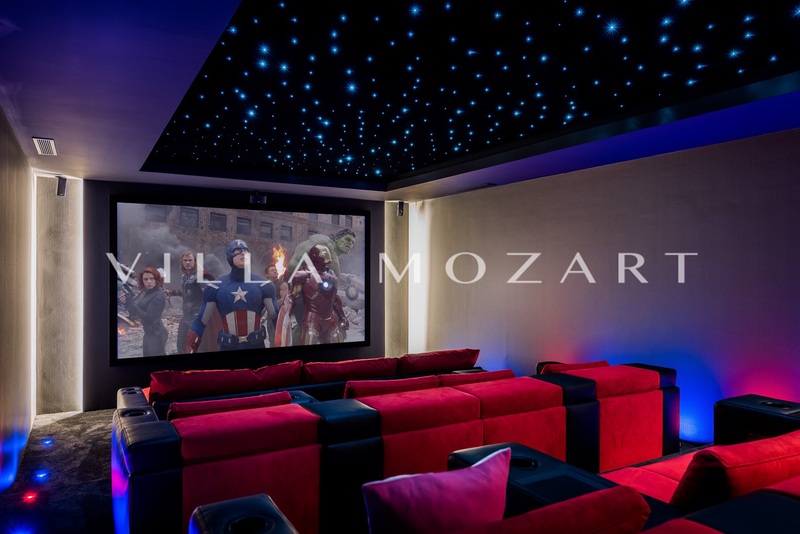 The lower floor of Villa Mozart is dedicated to your leisure time, with a variety of spacious rooms set up for sports, entertainment, relaxation, and enjoyment of the finer things in life. Downstairs at Villa Mozart, you'll discover a wealth of ways to look after your body and soul. 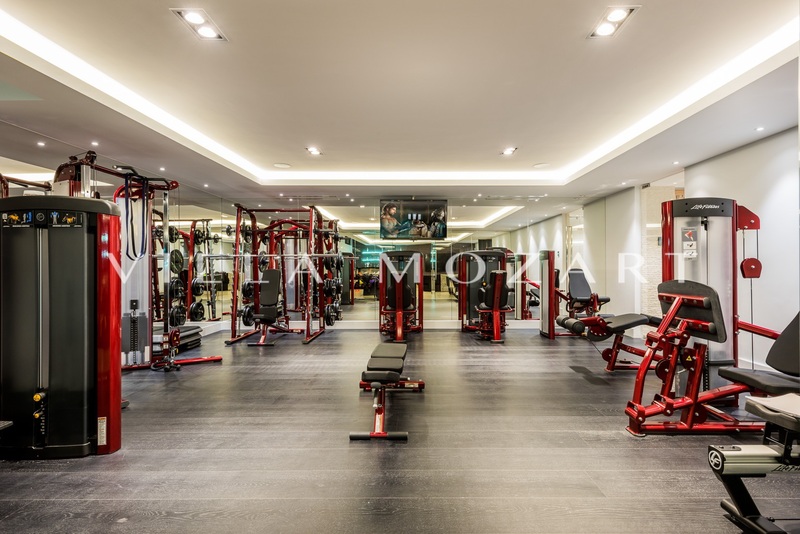 For sports lovers, the 200m2 gym and fitness room, together with a sauna and steam bath area, can be accessed from the interior or garden, while the vast games room and bar, home cinema, feature wine cellar, and garage for four vehicles, will appeal to those who prefer gentler pursuits.